Our coach training program was developed in collaboration with the McGill University Sport Psychology Research Laboratory and Mobius Executive Leadership Canada as part of the Innowaeve strategic planning process launched by the J.W. McConnell FamilyFoundation. The program is called 4×4 Coaching and includes the exploration of four dimensions of coaching through four learning channels. The multiplier effect has a positive impact on people and their environment. 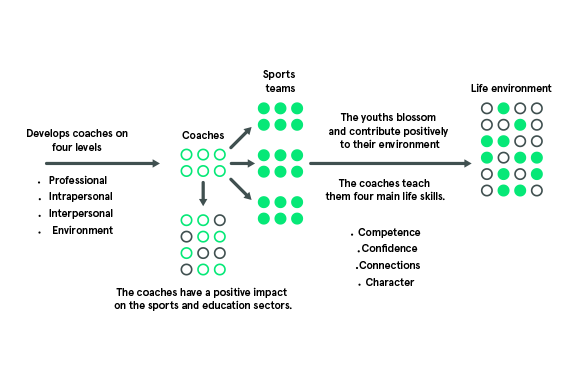 The Pour 3 Points organization has an exponential effect: the coaches we train work with approximately 12 young people per year. They become agents of change within the sports community and the education sector. Lastly, the youth participating in the program have a positive impact themselves on their environment.